More snow, cold to come for many parts of the U.S. 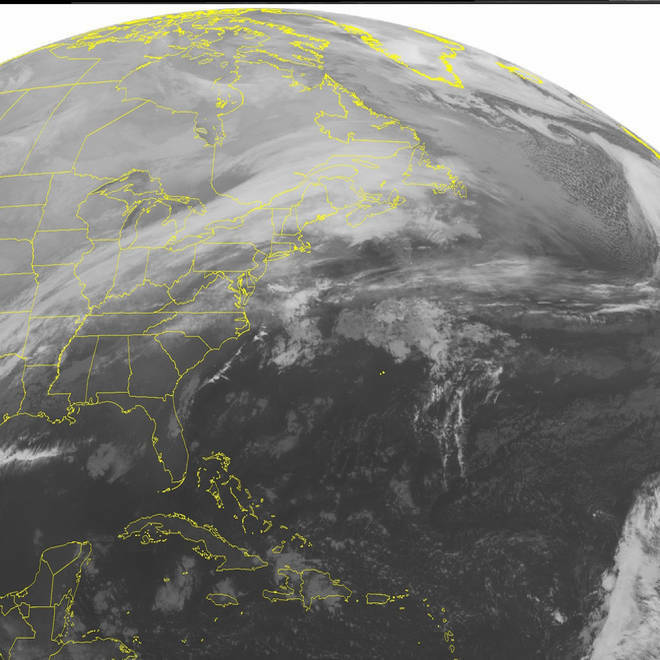 This NOAA satellite image taken Sunday, Feb. 2, 2014, shows a dense cloud cover as a frontal boundary runs across the eastern Great Lakes, Ohio Valley, Mid Mississippi Valley, and Southern Plains, with rain and some snow. More frozen precipitation is headed for the Midwest and Northeast — and even the South again — on Monday and then a second storm will leave those areas, as well as the Great Lakes and Plains, in snowy or rainy conditions through Wednesday, meteorologists predict. Sandwiched by extreme cold and the upcoming snow, Super Bowl weekend in the northeast was surprisingly mild at 50 degrees with hardly any precipitation. The respite will be short-lived, though, with the first dusting of snow expected at dawn in the Northeast on Monday, according to The Weather Channel. The snow will progress to the Ohio Valley, central Appalachians and even northwest Texas. Parts of Texas were already under a winter weather advisory on Sunday, due to the threat of freezing rain, according to NBC Dallas Fort Worth. Still, most states won’t see more than four inches of accumulation during the first storm, and ice is not expected to be a big problem. Yet another winter storm will bring snowfall and ice to parts of the Midwest and South. But southeastern Oklahoma has the potential to be an exception, where ice accumulation could be heavy enough to affect power lines, Weather.com said. Across the Plains and Midwest, temperatures are expected to be 15 to 25 degrees below average for this time of the year, according to the National Weather Service. California may even see some flurries and showers as a result of Monday’s storm system, according to the National Weather Service. The state is suffering from a severe drought after one of the driest years on record. A second storm will bring rain to the Northeast, as the region warms up on Tuesday, but the Midwest might see a “significant swath of snow” in the middle of the week, Weather.com said. Nebraska, Kansas, Illinois, Indiana and Michigan could also all get six or more inches of snow between Tuesday and Wednesday, Weather.com predicted. Ice could also accumulate in western Pennsylvania, western Maryland, northwest Virginia, and eastern West Virginia and threaten power outages starting Tuesday. In northwest Arkansas, nearly 50 people — mostly members of Florida State University’s track team — got a scare when a bus carrying them to an airport skidded off a state highway. No one was injured. The 47 people on board were removed safely and transported to a nearby elementary school, according to the Associated Press. And travel headaches won’t only be the result of icy roads, but also high winds that will likely lead to poor visibility in these areas. Millions in the U.S. have already suffered from an unforgiving winter, especially through the month of January, and they might not get a break for a while. And last week, Southern states like Georgia and Alabama were caught flat-footed by just a few inches of snow — leaving motorists and school children unable to get home. Meanwhile on Sunday, the revered weather forecaster Punxsutawney Phil — a groundhog — saw his shadow, signaling six more weeks of winter.